Tulle is a fabric made from 100% premium quality of nylon and sometimes silk. It is a fine netting material, and light weighted material that is used for decoration purposes and the garments as well. These tulle fabrics measures in the size of width: 6 inches and length: 25 yards. These tulle fabrics can also use in the making of wedding gowns for brides. At BB Crafts, our glitter tulle with multi striped is used to impress guests these and add a little fun towards any of your craft projects. 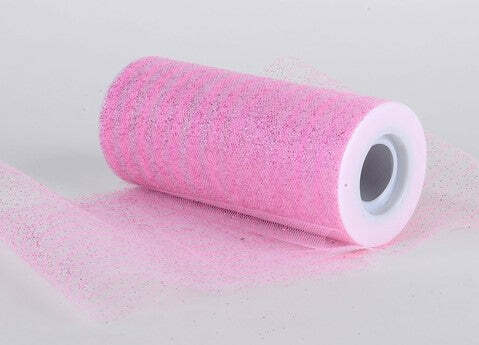 There is also tulle roll multi striped without glitter that is available at our online store. At our online store, these tulle materials are available in different colors, sizes, and patterns. The colors are yellow, orange, purple, Apple Green and much more and if the preferred color is not available in tulle roll, you have an opportunity to bleach the net according to the need of color. Browse through our collection of tulle fabric at a reasonable price that gives your decoration a stunning look.